Born in Gloucester in 1977, William has always been a creative force. He dedicated his early years to travel, theatre and creative writing, completing a Ba Honors in Theatre at Dartington College of arts. After college he made the decision to work in metal and bringing to life his creative visions in the form of practical, usable objects. 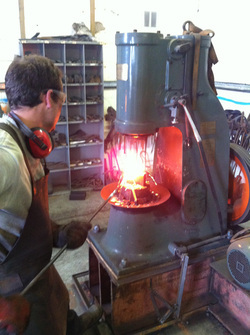 William trained as a blacksmith at Hereford College of Technology, graduating in 2003. Since then he has built his portfolio as an Artist in Metal, winning various awards for his work and gaining a Diploma of Merit from the Worshipful company of blacksmiths for excellence in his craft, awarded in London in October 2008. Heavily influenced by the arts and crafts movement in terms of a simple clean style combining perfectly with practical purpose, William has been making unique architectural and sculptural commissions since establishing his Artist Blacksmithing company "Complete Forge" in 2004. Aside from large scale forge work, William has an obsession with damascus; layered contrasting steels, other wise known as pattern welding. His passion for food, cooking and love of steel have come together in perfect harmony in creating wonderful kitchen knives. His aim was to combine his knowledge and experience of manipulating steel into beautiful objects with a desire to have in his hand a kitchen knife with the best possible performance a perfectly balanced extension of your body. What started as an obsession and desire to achieve excellence has now become a major part of William's business, working with Chefs and enthusiastic home cooks all over the world to create their own made to measure dream Kitchen knife. To explain my process to make the best knife possible for the task in hand. In this I hope to interest and educate potential customers to help promote an understanding of the extra time and care that goes into making a Custom kitchen knife. Kitchen knife Gallery, to Provide a Showcase of finished work, giving detailed shots showing you the quality of finish, the grind geometry, the nature of the materials,patterns which are possible, and my overall designs. Which is the best choice of kitchen knife for you? My Custom order section is a place which will lead you through the ordering process, help you understand the differences in materials, different profiles,lengths, Handle type and size, Here you can also budget your project. While a high quality of work never comes cheap I hope my range of sizes and materials can accommodate most people looking for something a step ahead in the knife world. Provide a Shopfront where you will have the opportunity to buy a Catcheside knife without the waiting time. From time to time practice knives or seconds, that may have a slight visual flaw not deemed to effect performance will come up for sale at a reduced price. I also enjoy working on one off pieces to try out new ideas with no end customer in mind. So keep an eye on the shopfront, for available knives and auction links. My video's are an invaluable way for me to communicate information about my knives, sharpening, maintenance and a place where you can see how my knives perform in kitchen cutting tasks. Please subscribe to Catcheside Cutlery on YouTube for your installments. A showcase of reviews and testimonials from owners of my knives. I will never pressure anyone to make a review for me. But I encourage detailed and honest reviews and critique. No matter how hard we try there will always be ways to improve and differences in opinions. My customers are my biggest influence. Lastly I will provide featured links and descriptions for sites which are important to me and I believe could be important and relevant to my customers. Please help me spread the word.